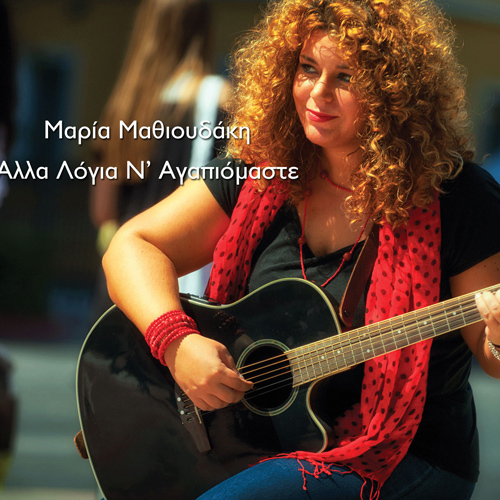 Maria Mathioudaki is a dynamic talented young singer who deserves your attention! She has studied for 5 years guitar, vocals and theory in National Conservatory and participated in children choirs of ERT (National Broadcasting Organization) and National Conservatory. After getting her degree in Political Science and History and her post graduated diploma in International and European Studies in Panteion University, she turned into music and presents now her first personal CD titled “Ala logia na agapiomaste”, in which she unersigns the music and lyrics and also interprets the songs. A pleasant surprise for the audience is her touching interpretation of Manos Loizos´ song “Koutsi kithara”.